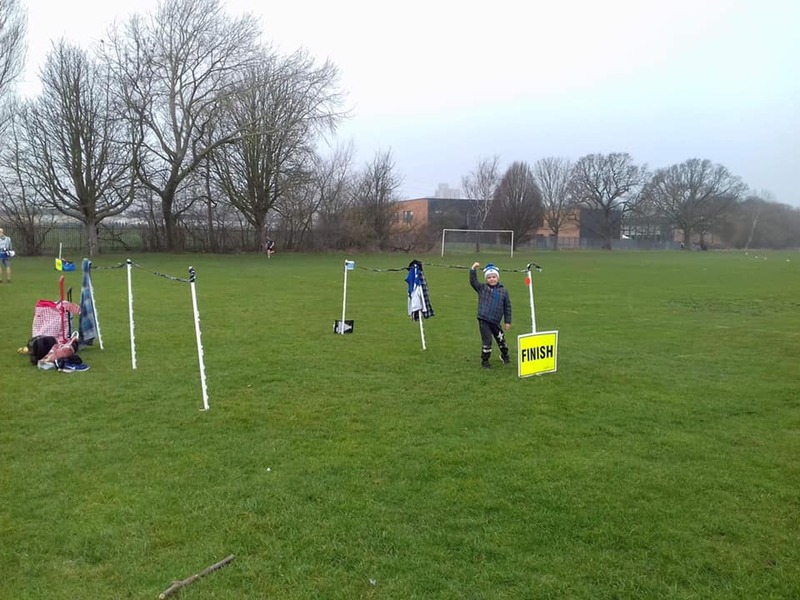 Event #56 – 9th February 2019 – Well, what a parkrun! Aaaanyways, having pointed out the tiny bit of sun that was trying its best to shine through the grey clouds, Scott counted us down and we set off. Well, next thing we knew it was chucking it down!!! And not only that, the blustery wind was sending it sideways!!! It stayed like this for a considerable amount of the run. The word ‘grim’ springs to mind. But we were not to be deterred! Soggy barcodes were no problem for our hi-vis heroes – as long as you have one actually with you, soggy or dry, you can be processed. The sun came out for many of our finishers, though those that went faster to get out of the rain may have missed it. Surprisingly there wasn’t a rainbow, but still the hot drinks and biccies (guarded by a young, seasoned volunteer who’s worn a glam volunteer vest no less than 26 times!) were most welcome! This week 25 people ran, jogged and walked the course, of whom 6 were first timers and 0 recorded new Personal Bests. Representatives of 9 different clubs took part. Today's full results and a complete event history can be found on our parkrun results page. P.S. A big thankyou to Parbinder, who trimmed some overhanging branches around the course recently. A job well done! P.P.S This is my first ever parkrun report and if I can do it anyone can! Volunteer roster sheets are always available at the post-run drink in the pavilion, along with volunteers who can tell you about the various roles. Why not give it a go? Whilst parkrun Event Directors sometimes dream of their parkrun becoming the most popular in the world, in reality large numbers bring a lot of stress and hard work. 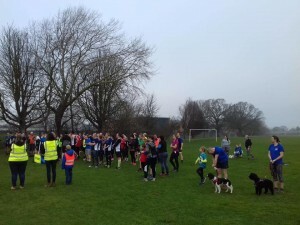 At Clifton, our numbers are relatively small compared to some other local parkruns, but, to me, things seem 'just right' most Saturday mornings at 9am at Clifton Playing Fields. As volunteers, we don’t stress too much as we set up the course, set up our pop-up café and dish out the Hi Viz vests. We have a regular crowd of volunteers who go about their business without much instruction being necessary as we speculate about how many runners will attend and inspect the course for any hazards. Our volunteers include lots of young children and that contributes very much to the feel of the ‘Clifton Family’. As a runner, Clifton is also ‘just right’. Parking is easy and all are welcomed to keep warm in the café prior to the run. The start is easy to find and the volunteers try to ensure that all are welcomed and that everyone knows where to go. The course is different to all the other local parkruns – completely on grass (with maybe a little bit of mud! ), very flat but interesting due to the slightly uneven conditions underfoot and the occasional molehill. It’s on the edge of Clifton so feels like we’re out in the countryside and occasionally suffers from the ravages of nature (flooding, cracking due to dryness, deep mud and the odd fallen tree). This week the course was firm underfoot and the running conditions were great for our 44 runners with cool temperatures and no wind which contributed to a number of new PBs. It contrasted starkly with the run here a year ago when the country was stricken by the ‘Beast From the East’ and Clifton had 204 runners (our biggest attendance) as it was the only parkrun that was not cancelled. We had a lot of tourists that day, and continue to attract a pleasing mix of tourists and locals. We are always particularly pleased to add to the local gang and get a new runner from Clifton. Thanks to all of our volunteers – great job as usual. Hope to see you all next week by the Tall Tree at the ‘just right’ parkrun. Last parkrunday played host to the 54th edition of Clifton parkrun, and the last parkrun of February 2019. A beautiful morning on the playing fields, showing strong signs of spring breaking through the end of the wintery months. A slight mist in the skies and a gentle feeling of peace and tranquillity, made this weeks event more the pleasant. There was a good turnout with 87 runners, all making the most of these good conditions under foot, with 18 new PBs in the field. A big well done also to Ben MIERS, Hazel MCCABE and Paula SHAW, all completing their first ever parkrun, please lets not make it your last. Thank you for choosing Clifton to be your first parkrun, and thank you to all the others who visited Clifton’s run for the first time. Please do come back and join us again soon. As ever at Clifton we had a few visitors including a runner from Torbay, and a strong contingency from Long Eaton Running Club, including Bethanie DENNIS who is celebrating her 21st Birthday this weekend. An impressive performance from the Long Eaton lot, with a couple of ringers at the front of the pack taking the first 4 across the finish this morning, with Aston PERRIN putting in a very impressive 16:14 time. Congratulations to all of the above but also to everyone who came along today and completed the course. 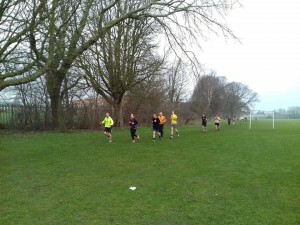 Full results from today, can be found on the Clifton parkrun Results Page. Of course, as with all parkruns, today’s event would not have been possible without the volunteers, Phyllis CAO, Mary CAWTHAN, Emma CRANE, Pete DAVIS-YATES, Lacie DAVIS-YATES, Matt PICKLES, Claire SELBY, George SELBY (who at aged under 10, put in an amazing job as a first time timekeeper), Kathy SHAW, Parbinder SINGH, Tj STEVENSON, Jane STUBBS, Peter USHER. To note, this weeks report was written by a first time volunteer, so the old adage of 'I cant do that as I am not experienced' doesnt stick at parkrun. If your free to volunteer shout up. If you fancy having a go at any volunteer role have a chat with one of the team, or send an email to clifton@parkrun.com. No prior experience is necessary! February 2019’s first parkrun and Clifton’s 52nd could seem in isolation to be just another Saturday but with over 270 parkrun snow and ice cancelations, almost half of the UK total, it was countrywide the worst since the infamous “Beast from the East” last March. Clifton parkrun however is not one to let a bit of snow worry it and having announced that both they had had no snow and to quote “we can run on snow anyway (woohoo)” it soon became my plan A for this week’s parkrun. This was also true for 112 others who came to walk, jog and run around the 2 and a bit lap trail/grass course. Run director today was Emma CRANE and with a chorus of barking dogs we were advised of the filming going on relating to a health and well being award Clifton has been nominated for although I think most people were just trying to keep warm and this was in all senses over our heads. Clifton is still a relatively new parkrun, having only recently celebrated its 1st birthday, so that combined with a more Winter-proof course resulted in about a quarter of those present being first time tourists (including myself). There were also 2 who were brand new to parkrun so a special mention to David MARTIN and Karen DOLLER. I don’t know if Clifton will become your home parkrun but do hope you enjoyed today and will come back to parkrun again, wherever it happens to be! Mud vs Frost = Good conditions ... well that’s how it seemed to me and also not a hill in sight but the cold air was a bit of a shock to the lungs. The balance of all that was 33 new personal bests. First place finisher was Philip NIND in a time of 17:43 with a mystery runner in second place. Quite a number of the later quicker finishers today were from canicross clubs (racing with dogs) which can lead to a faster time with a well behaved dog so will just note that today’s first female finisher was Rebecca BROWN in a time of 19:27 (also today’s highest age grade – 76.09%). First junior finisher was James HICKMAN in a time of 24:05, a new under-11 age category record. Congratulations to all of the above but also to everyone who came along today and completed the course. Full results can be found at http://www.parkrun.org.uk/clifton/results/latestresults/. The event would not however have been possible though without 17 wonderful volunteers: Scott CAWTHAN, Mary CAWTHAN, Emma CRANE, Robert HACKFORD, Seren INGLE, Michaela INGLE, Cavan INGLE, Simon MORGAN, Chris NEALE, Dorothy RUBERY, Parbinder SINGH, Jackie SMITH, Tj STEVENSON, Mackenzie STEVENSON, Jane STUBBS, Damian BAKER and Hannah WELCH. A special mention to Tj STEVENSON who volunteered for the 25th time (purple T-shirt hopefully on its way soon) and also earned himself a big PB today after helping earlier with pre-event setup. Thank-you to you all and if you are reading this and want to get involved in future weeks then all details can be found at http://www.parkrun.org.uk/clifton/futureroster/. There many different roles to choose from. Just one attendance milestone today and that was visiting Andrew KELLS completing his 100th parkrun, the other 99 being at Long Eaton. Congratulations! Today’s parkrun finished with coffee and a biscuit at the pavilion (donations gratefully received) and a kind offer of a lift to the nearest tram stop, again emphasising that parkrun is so much more than just a run in park! Many thanks to Clifton parkrunners and volunteers!! Damian BAKER, a tourist from Daventry, signing off. Last week was our first birthday, which was marked by a large turnout of approx. 150 runners, a freezing cold day, and a special appearance by Spiderman as our Run Director. We had a large number of tourists who had come to help us celebrate, cakes, and a variety of fancy dress outfits. This week we were back to normal, with no apparent superheroes, although we know that they sometimes come in disguise. Ian Howe produced the fastest finishing sprint ever seen at Clifton, raising suspicions that he may be a Clark Kent type… Matt Keyworth noticeably ran 4 seconds slower this week without his superhero outfit, so probably best that he reverts to his outfit next week. It was also great to Steve Leek finally making an appearance at his home parkrun… after 196 runs elsewhere! Many visitors to our parkrun seek out the RD to thank us before leaving and often comment that though we are a relatively small event, we are as welcoming, friendly, noisy and enthusiastic as any others they’ve been too. Today was no exception, as we cheered our 48 runners around the course. We had a number of first timers, including a number from Clifton itself, and Raisa returning for that ‘difficult second parkrun’. We had peter Savage running his 100th parkrun, but choosing to keep a low profile… well done Peter and thanks for choosing us for this important event. The course itself is reverting to the challenging muddy state we all remember from early last year. It reminds me of a school cross-country course. When I mentioned this to two of our first timers today, they told me that it is where they used to actually do their school cross-country runs many years ago.. happy memories no doubt! Thanks to our superb volunteers, particularly the youngsters, including Isabelle, Mabel and who dealt with the tokens at the finish, Cavan on event set-up and Charlie and Imogen who were part of our tail-walking group. Thanks to the grown-ups too! Hope to see you next week – please tell your friends how good Clifton parkrun is. This week 45 people ran, jogged and walked the course, of whom 15 were first timers and 7 recorded new Personal Bests. Today's full results and a complete event history can be found on the Clifton parkrun Results Page.